Butternut squash is one of those Fall favorites that a lot of people can't wait to get their hands on. It's full of beta carotene as you can tell by it's bright orange color. I bought one a couple weeks ago when they were on sale for 99 cents. It's been sitting on my kitchen counter since then! 99 cents is a great deal, especially considering you can do so much with one butternut squash. I never had butternut squash for the first time until about two years ago. Hard to believe, I know! How did I ever live without them before? I personally love making butternut squash soup. In our kitchen, we prefer to not make it sweet. The first recipe we ever used called for a little cinnamon and nutmeg, I think. My hubby didn't like it that way at all. Since then we usually try to make our butternut squash as savory as possible. 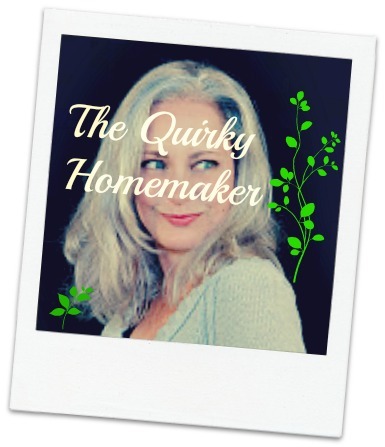 I love combining ingredients you might not normally think about putting together. 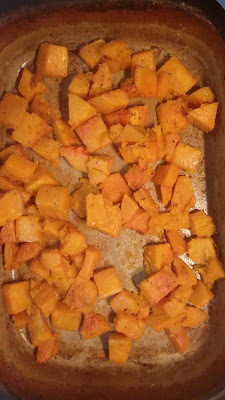 My original cheesy idea for butternut squash was to top some butternut squash with blue cheese. I love the juxtaposition of the natural sweetness of the butternut squash with the tang and bite of a blue cheese. I didn't however have blue cheese in my kitchen, so I used feta cheese. I also wanted the crunch and saltiness from bacon. I love bacon any way it comes and I loved it on this salad. It only took one strip of bacon to get the added salty crunch that I was after. To up the tang factor even more, I cooked my quinoa with a little lemon juice and moringa powder and used a little store bought Greek dressing on top. Yum-mo! Note: This way may be waaaay too tangy for some people. Just cook your quinoa according to package directions without the lemon or moringa. I put everything on a bed of spinach and had a fairly healthy Fall salad. 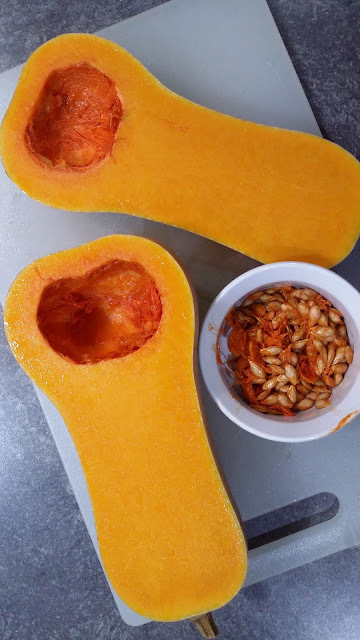 *Cube a seeded butternut squash and cut peels off. Keep the seeds!! You can roast them the same way you would pumpkin seeds~~maybe a little less time though, since they're smaller. 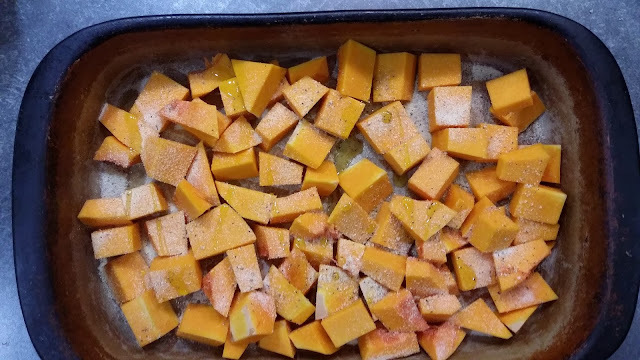 *Put butternut squash in a 9 x 13 baking dish. *Sprinkle with 1 teaspoon of garlic powder, 1 teaspoon of onion powder and 1 teaspoon of lemon pepper seasoning. *Drizzle 1 Tablespoon of olive oil and toss butternut squash with seasonings and olive oil until all of the butternut squash is coated. *Roast in oven at 425 for about 45 minutes, occasionally stirring. While butternut squash is roasting, start the quinoa. Turn burner off and let sit at least 5 minutes. Place about 1 cup of baby spinach in a salad bowl. Put half of the cooked quinoa onto the spinach. Put 1 cup of the roasted butternut squash on top of the quinoa. 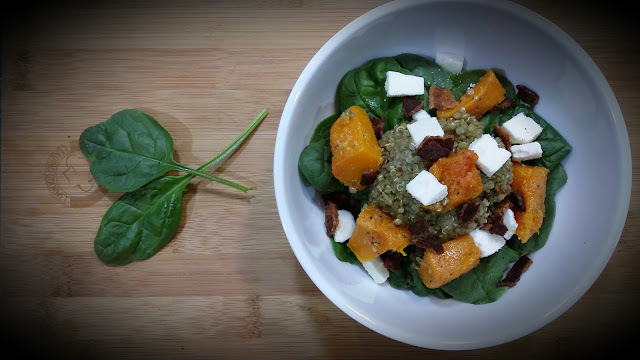 Sprinkle crumbled bacon and feta cheese over the butternut squash. Drizzle Greek or your favorite dressing over the top. 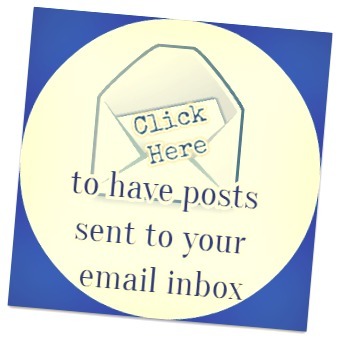 Enjoy the health boost from the nutrient dense salad!